This Plan, provides mobile-optimized streaming videos, games, music†& 8 Gigs Mobile Hotspot, w/ Unlimited 4G LTE for most everything else. Up your streaming experience. 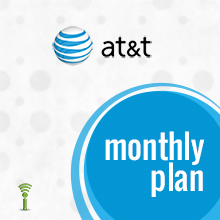 Add HD to your monthly plan for just $10/mo. and watch, listen and play in unlimited HD*. Data *After high-speed data allowance is used, data speeds are slowed to a max of 128Kbps for the rest of the term. **$65 Monthly Unlimited Plan: After 22GB of data usage, AT&T may slow data speeds during periods of network congestion for the remainder of your 30-day term. Data speed limited to a max of 3Mbps. ***$85 Monthly Unlimited Plan Includes 6GB of Mobile Hotspot. After 6GB, hotspot speed limited to max of 128Kbps. For use in U.S. only. NETWORK Nationwide on AT&T GSM Network. COVERAGE Nationwide on AT&T GSM Network. REFILL INSTRUCTIONS Some AT&T refill PINs do not work if loaded via their website. Please try to remove the spaces/dashes (if there's any) before copying the PIN to AT&T website. Or you may try loading the PIN directly to your cellphone by following this sequence: PRESS *888* + PIN number + # + SEND (ex. *888*1234567891234# then hit the Send button) To load PIN beginning with "30104-", please call 1-800-403-7801 and follow the instructions OR follow the *888* loading instuctions above to load the PIN using your GoPhone. For TDMA phones: PRESS #20 + (PIN number) + # + SEND. Or, dial 611 (or 1-800-901-9878 ) from your wireless phone - a free call. Follow the instructions to add the PIN value to your account. You can also use 611 to check your account balance. If you are a new AT&T GoPhone Customer and have never used your phone before, you need to activate your phone by calling 1-877-426-0525. - For technical assistance, please call 1-800-901-9878.